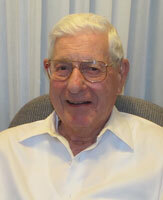 Robert C. Blasingame, 95, of Sarasota, FL passed away Saturday, October 15, 2011, at the Springs at Lake Pointe Woods. Born in Auburn, AL, he was the son of the late Ralph U. and Sue Mae Combs Blasingame. He was married to Marjorie Strode Blasingame. Robert received his undergraduate degree from the Penn State University and his masters degree from the University of Pittsburgh. He worked as an Industrial Engineer for ALCOA. He served as planner and project manager of ALCOA of Australia and ended his career as manager of European Operations. He was a founding member and past president of the Penn State Alumni Association. He was also a member of the Sarasota Power Squadron and a member of the Church of the Palms in Sarasota. Morristown, TN; 1 son, Robert C. Jr., husband of Cheryl Blasingame of Exton, PA; 3 granddaughters, Meredith Wilber, Erika Iskowitz, and Kari Iskowitz; a great-grandson, Alexander Wilber. funeral home on Thursday. Kindly omit flowers. Contributions may be sent to the American Cancer Society 314 Good Dr. Lancaster, PA 17603.